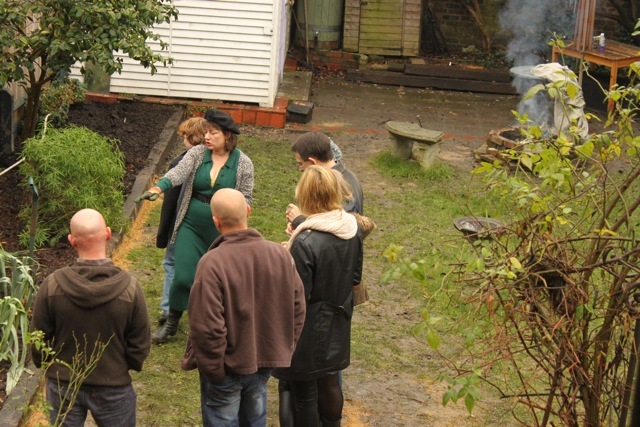 The Secret Garden Club workshop on December 21 discussed planting, growing, harvesting storing and cooking with alliums. There are approximately 750 different varieties of allium, ranging from ornamental plants grown for their striking spherical flowerheads, to edible crops including chives, garlic, shallots, onions and leeks. The distinctive onion taste comes from sulphurous compounds found in the bulbs and/or stems of the plant. On the whole, alliums are straightforward to grow and to look after. You’ll be rewarded by always having onions or garlic on hand, as they store well, or by being able to snip a few chives from a plant growing in a pot or in the kitchen garden. You can buy leeks as seedlings but they are easy (and much cheaper) to grow from seed. They are usually started off in a seed bed – an area of well-drained, fine soil. The main benefit of this is that it saves space in the spring and summer when you might need it for other veg. Starting the plants off in fine soil also helps to grow straight, undamaged plants. Sprinkle seed evenly in the seed bed. Thin as soon as the seedlings are big enough to handle (and use the thinnings in a salad). Traditionally you plant out leeks on the longest day of the year (ie, June 21), or most gardening books will suggest, when they are the thickness of a pencil. When you transplant leeks you use a technique called ‘puddling in’. With a dibber, or a trowel handle, make a hole deep enough to take about two-thirds of the leek seedling. Drop the leek in and fill the hole with water. 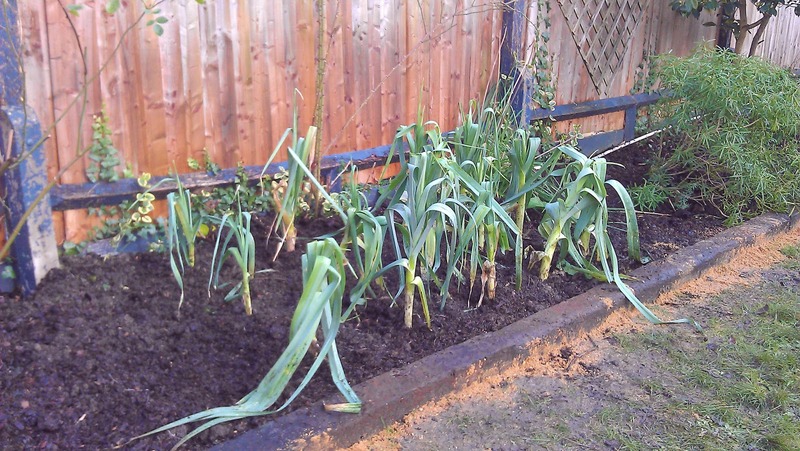 Don’t firm the soil around the leek, just let the water and soil settle around the plant naturally. Leeks like rich soils and plenty of water and regular feeding. Seaweed extract is excellent for them. Actually seaweed extract is excellent full stop. Like other alliums they should be weeded regularly. Because they are tall thin plants, they don’t offer much ground cover. Weeds compete with your crops for the water and nutrients in the soil. If they get really big they may compete for light as well, so keep the ground around the developing leek plants clear, preferably hand-weeding so that you don’t damage the leek stems. You can start harvesting leeks as soon as they look good to eat. So you can start with baby leeks in late summer and leave some to fatten up over the autumn. Do not try to pull leeks from the top. All that will happen is that the leaves will break and leave you with a ragged stem still in the ground. Always take a fork and lift them from the bottom. Leeks are very hardy. You can leave them in the ground over winter and they won’t come to any harm, although if the ground is frozen they will be difficult to harvest. Here you can heel them in – this means lifting them, then laying them down side by side and covering shallowly with sand or fine compost. They’ll be quite happy like that and it will save space on the plot if you need it. Garlic is grown by planting individual cloves in the ground. These develop and mature as bulbs made up of many cloves themselves. Folklore has it that you should plant your garlic out on the shortest day of the year and harvest it on the longest. The development of the garlic plant is affected by day length – the increasing hours of daylight stimulate the development of the bulb – so it makes sense to plant before the days start to get longer. It’s tempting to simply plant out garlic that you buy in the supermarket – it’s cheaper than buying garlic from a plant nursery and there’s no visible difference. 1. Supermarket garlic may have been imported from Spain, or France, or simply not be a variety that’s bred to thrive in our climate. 2. If you buy garlic for planting from a reputable nursery, it will be guaranteed to be virus-free. Some soil preparation might be needed. Garlic doesn’t need very rich soil and it doesn’t like fresh manure. The Secret Garden Club’s soil is sticky clay, it’s a good idea to lighten the soil a bit by digging in sand, or kitchen compost, or leaf mould, or just the multipurpose compost you buy at Homebase. Take your garlic bulb and separate it carefully into cloves. Don’t peel them. Push each clove into the ground, upright, with the root end at the bottom. The cloves should be buried about 6mm or half an inch deep. Firm the soil lightly over the top … and pray for cold weather. Garlic likes to chill for a while after planting before it sends out green shoots above ground. These shoots should start to show about the beginning of February but much depends on the weather conditions. From now you don’t really need to do anything except keep the garlic bed as free of weeds as you can. Like all alliums, the way the plant grows upright means there is no ground cover to deter weeds. Hand weeding is best: if you’re tempted to use a hoe, you run the risk of slicing through your developing garlic bulb. Don’t water the allium bed either unless you are in the grip of a prolonged drought. A wet crop is more prone to softening and rotting than a dry one. There is only really one other maintenance job to do: if you see a flower head forming, snip it off. You want the plant to focus on producing a nice big bulb, not flowers. Have a look at your garlic on midsummer’s day – if the bulbs look plump, they can be harvested. Shortly after midsummer, the plant will start to go brown and wilt. The leaves will almost certainly develop some rust – orangey brown spots. The collapse of the plant is a god sign that it’s ready to harvest. Pull or dig the bulbs up straightaway. You can use them in cooking immediately, but if you want to store them to keep into autumn and over winter, they need to be dried first. Traditionally, the plants are left, unwashed, on racks in the open air to dry out and ‘bake’. This is all very well in the south of France, but given the UK’s unpredictable climate, you’re better off finding somewhere sunny and well-ventilated, but indoors. A conservatory, or under a kitchen skylight, or in a greenhouse with the door and vents open are all good places. I hang mine in a plastic patio greenhouse with the door open. After about three weeks, the skins will be papery and the stems dried out. To prepare for storage, trim the roots, and rub off the dirty outer layers – don’t peel or expose the cloves. Tidy up the stems and leaves and trim to about 8 inches. Now the garlic bulbs can be strung up, or plaited, and hung in a light, well-ventilated place. They should last well into the New Year (if you don’t eat them all by then). There are some intricate plaiting techniques and nothing looks better than a fat sturdy garlic plait. 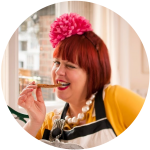 This website has good photo instructions for making a classic plait – of onions, but it works for garlic (and shallots as well) that looks good and will store your garlic tidily. Much of what we’ve already discussed with garlic also applies to other alliums. Onions and shallots also like a light, well-drained soil. Don’t use manure, but add organic matter such as leaf mould, compost, or sand, to heavy soils such as London clay. In a domestic garden, we’d recommend shallots over onions. They tend to be more expensive than onions to buy in the shops; also they are more space-efficient. 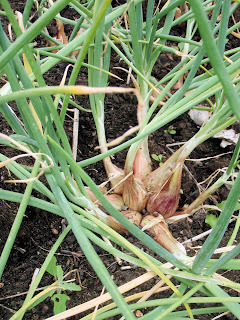 One shallot set planted will split and give you many shallots to harvest. One onion set planted will give you one mature onion bulb. 1. Sets are easier, less time-consuming and less susceptible to pests such as onion fly. 2. Shallots grown from seed won’t split into multiple bulbs. 2. A seed-grown onion is less likely to bolt, ie, to produce a flower head instead of a bulb. In practice you can buy heat-treated sets which are also less likely to bolt. 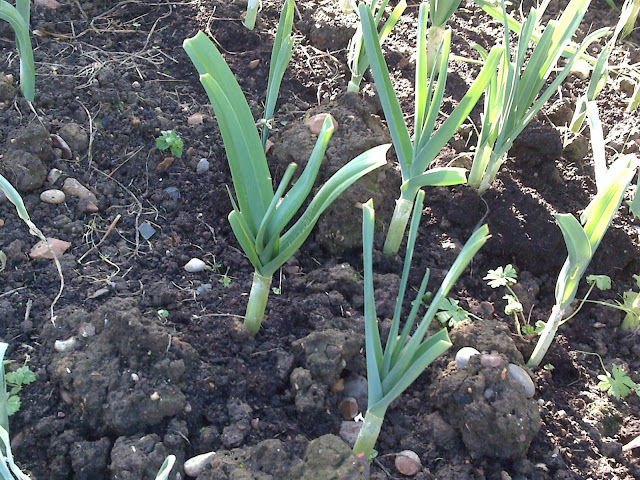 You can plant overwintering onion sets out in the autumn, particularly Japanese varieties. These will be ready to harvest in early summer, but they need to be used quickly – they don’t store well. The other time to plant out onion sets is in early spring – February onwards. These onions will be ready in late July/August and can be stored for use over the autumn and winter. Both onions and shallots should be planted out, base downwards, so that just the tip is visible above the soil surface. Unfortunately, birds seem to find these tips irresistible and will pick them out of the ground. The don’t eat the sets, but leave them lying around. 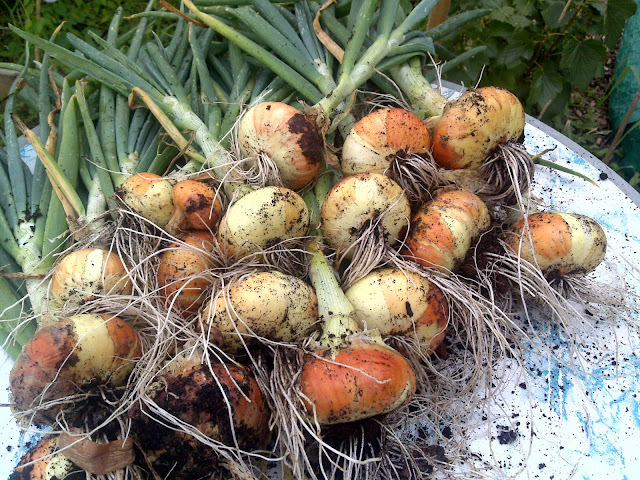 Experts like Bob Flowerdew says plant them back in again, and I’m loath to disagree with him, but I’ve always found the up-ended sets don’t replant well, so instead I cover newly planted shallots and onions with a net. Once the sets have rooted and sprouted the net can be removed. Onions and shallots can be harvested like garlic. Leave the stems to dry out in an airy well-lit space. Then clean carefully, separate the shallot bulbs, and string up or plait. You can also hang onions and shallots up in nets if the idea of stringing or plaiting is too daunting. These are not usually troublesome, usually a low-maintenance crop apart from the weeding. If you grow from seed, onion fly can be a problem when thinning or transplanting. Some people suggest planting parsley around onion seedlings can mask the smell. White rot can be a big problem – it’s a fungus which will persist in the soil. You’ll find fluffy white mould around the base of stems and skinny, sometimes non-existent, bulbs. The crop will be unusable. There are a couple of things you can do to fight white rot. First of all, as soon as you find you have white rot, wash and disinfect all your tools so that you don’t spread the spores. 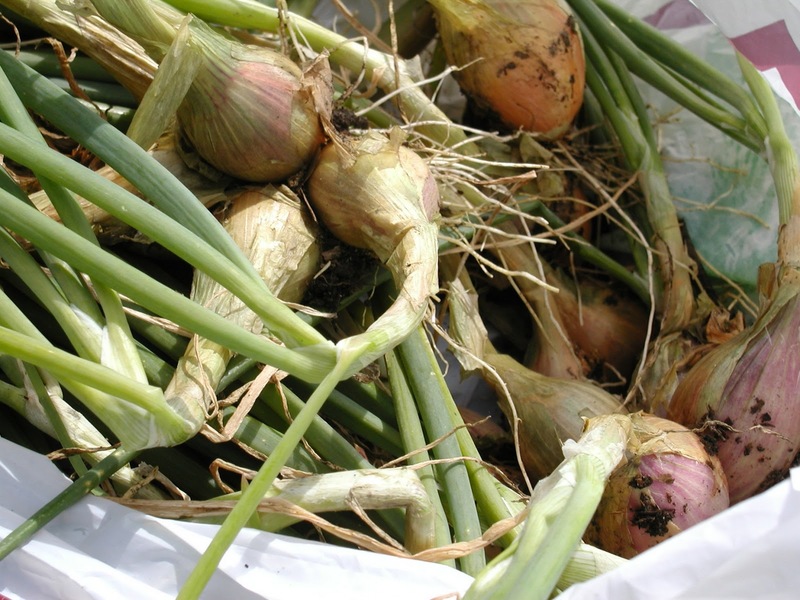 Remove what remains of your onions and soil around the affected bulbs and incinerate it all. Then get some Armillatox (patio disinfectant) and following the instructions for diluting it to the letter, liberally soak the affected bed. Leave it for at least three weeks before growing anything in the bed. See the Armillatox website for more information. Grey mould is a distinctive grey fur, and associated with onion neck rot where the bulbs go soft and brown. Excessive feeding with high nitrogen fertilisers is a strong contributory factor for this – another good reason to practise benign neglect on your onions. 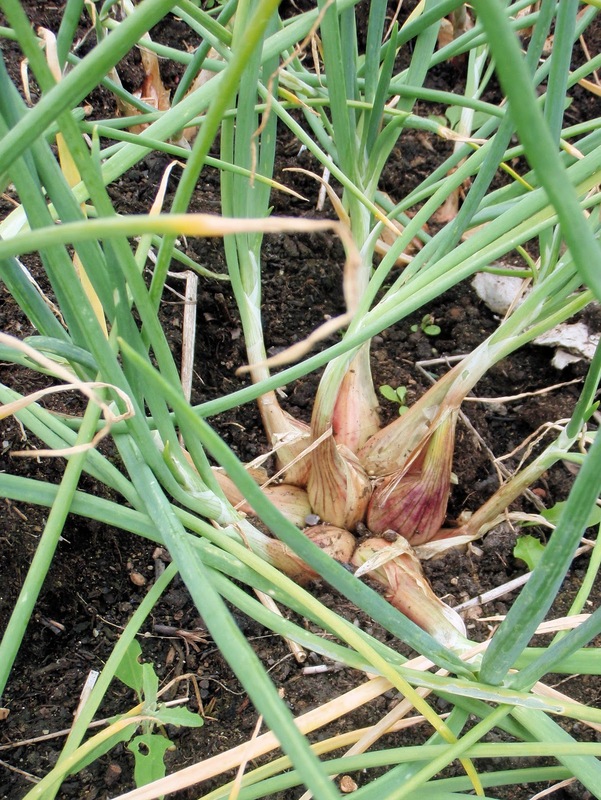 Rust – some rust spots developing on garlic, onions and leeks as the plant matures is very common and needn’t be a problem. One thing worth mentioning is that alliums don’t like acid soils. If you suspect that your soil might be acid, you can add lime to it or in a raised bed, use spent mushroom compost which has a mildly alkaline effect and is also very good for lightening heavy clay soil. You may have problems with leek moth, which is prevalent in the south of England. The first thing you’ll notice is your leeks look ragged and stop growing. If you look closely you will see what looks like webbing or cocooning in the middle. The best thing to do is to prevent leek moth damage in the first place. When you plant out your leeks, throw a very fine net such as Environmesh over the crop. This can be safely lifted in November when the moth is no longer active. If you find a leek moth infestation has already taken hold you can rescue your crop. Cut the plants right down to the ground, so that you cut out all the damaged foliage and remove the caterpillars. Burn the cuttings (don’t compost or the caterpillars will survive to create another generation). Your leeks will grow again. They won’t win any prizes at the show, but you will get edible leeks. These leeks were trimmed to cut out evidence of leek moth and regrew quite happily. Allium folklore – true or false? You should plant garlic on the shortest day and harvest on the longest. True-ish. Your garlic won’t come to any harm if you do this. Ideally plant before a cold spell (so, late autumn). Take local weather conditions into account before sticking too closely to any rules. You should bend over the stalks of onions/garlic to help them mature. False. Don’t do this – it will damage the stalk and could let in disease, affecting the storage life of the bulb. You should plant onions around your carrot crops to deter carrot fly. True-ish. This is known as companion planting and many people swear by it. Be aware though that the distinctive allium smell may also attract its own pest, the onion fly. If you rub the cut side of an onion over a bald patch, your hair will regrow. False. No scientific basis for onion as hair restorer. Placing a cut onion in a room will absorb germs and bacteria. False, although this legend is very persistent. It was a preventative used in times of plague in both UK and US when they believed disease spread through foul air or ‘miasmas’. These grow easily in a pot or on the open ground. Kept near the kitchen door, you will always have chives on hand to snip into salads, or on omelettes or scrambled eggs, giving your dishes a distinct but mild onion flavour. The attractive pink flowers are also edible. There’s quite a lot of confusion over plant names in the Allium family, but I’m pretty certain these are the same thing as Chinese chives. They’re certainly multi-purpose in that you can add them authentically to Chinese food but also use them interchangeably with ordinary chives. And the white flowers are also very attractive – and edible. Or ‘tree onions’, but let’s face it, Egyptian walking onions is a much more evocative name. Now these are weird: the bulbs (or more correctly, bulbils) develop at the TOP of the stem. At the end of the season, you can harvest your onions from above ground, then gently bend the stalk over to the ground to plant one remaining bulb. Hence the plant will eventually ‘walk’ around your plot. There are sweet onions which can be eaten raw, like an apple. You can buy them in the UK – Sainsbury’s stocks them in their Taste The Difference range – but it is the Americans who are the connoisseurs of sweet onions and who selectively breed many varieties of onion specifically for their high water and sugar content. One of the most well-known of these are Walla Walla sweets. They look just like an ordinary yellow onion and grow in or near Walla Walla in Washington State. Walla Walla sweets were originally brought to the US from Corsica at the beginning of the 20th century. They’re been selectively cultivated ever since to maximise their sweetness, which is down to a low sulphur and high water content. You’ll know the smell of this – it’s that gorgeous green garlic aroma you get in damp woodlands in springtime. Wild garlic has no fat bulb – you eat the leaves which have a distinct but mild garlicky taste. It’s a seasonal treat only and can be tricky to cultivate, although once it’s established it will spread very easily. Not strictly speaking garlic, but a type of leek, elephant garlic looks to all intents and purposes like a huge bulb of garlic, made up of enormous cloves. The flavour is not as strong as ‘ordinary’ garlic – they are fantastic roasted underneath a joint of meat with the garlic flesh then crushed and creamed.